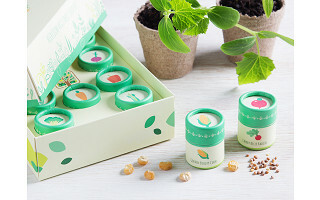 This seed starter kit is the perfect initiation into gardening. It’s beautifully designed, carefully sourced, and Made in the USA to help you discover your green thumb. Each kit has 10 different seed capsules. Whether you decide to make a delicious heirloom veggie garden, a wildflower one, or grow your own herbs, you’ll have a vibrant, colorful garden peppered with a variety of plants. And the folks at SproutBrite aren’t about to leave you in the dark. An included booklet covers all the gardening bases—instructions on indoor and outdoor planting, calendars to time it right, and pairing charts that show which seeds grow well together. Whether you gift it or think it’s too inspiring to give away, SproutBrite is bound to make the world a greener place. What's up Grommet fans! My name is Domenick and I am the founder of SproutBrite products. I am really grateful to be given an opportunity to be here with you today. As a founder my goal was to create a brand of products which promote positivity, smiles, & togetherness. I chose to start with Gardening kits because as a kid I spent a lot of time in the garden with my grandparents. This helped strengthen my connection with them and I hope these products give you an opportunity to do that in your own life with your family & friends! Look forward to being a part of the Launch today! @Domenick Question: Does each container have just a few seeds like 10 or is there many many depending on the size of the seed. @Jason Hey Jason, we measured out the quantity based on the seed packets found in most garden shops. @Jason We aimed to deliver the same value as someone buying the ten individual seed packets. @Domenick - First, I have to say I LOVE the idea of this kit. I always walk up to the counter with about 30 seeds and need to reassess. Having it prepicked is AWESOME! Thank you! On a personal note, I was actually hoping they would be less than individual seed packets. I know it sounds crazy but when I buy a packet, I don't need 20 basil plants, but I could use 20 carrots. I don't need 10 cucumber plants, but I do need 10 corn stalks. Whenever I buy the packets, I always end up with the most unbalanced garden then end up giving away half the seeds I've cultivated or trying to freeze the seeds for the following year.. and even then, who knows if they're going to be ok. Just a thought. Thank you for this awesome product! @Margo Thank you for such kind words!! Really appreciate that! It's always so interesting to get perspective from different people! A lot of people would normally complain and say they did not get enough. It's so refreshing to see someone who is happy to receive enough of what they need & plan to use! One nice thing Margo about having a little extra with the kits is that the tubes are really convenient for storing the extra seeds :) Happy planting! Dominick, Which herbs are contained within the herb package? Can you pick the items you want in a kit or are there only the pre chosen options? There are certain veggies we like more than others. @Hyddin Hey Hyddin! Thanks for your question! The kits are pre chosen and we are not able to customize them at this time! In the future we will certainly consider that idea! 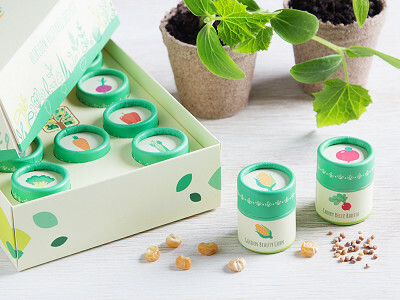 This seed starter kit is the perfect initiation into gardening. It’s beautifully designed, carefully sourced, and Made in the USA to help you discover your green thumb. Each kit has 10 different seed capsules. Whether you decide to make a delicious heirloom veggie garden, a wildflower one, or grow your own herbs, you’ll have a vibrant, colorful garden peppered with a variety of plants. And the folks at SproutBrite aren’t about to leave you in the dark. An included booklet covers all the gardening bases—instructions on indoor and outdoor planting, calendars to time it right, and pairing charts that show which seeds grow well together.